The Garmin StreetPilot 2720 is a premium GPS automotive navigator that offers text-to-speech and traffic interface capabilities. In addition to the turn-by-turn voice prompted navigation available in earlier StreetPilot models, the Garmin 2720's text-to-speech functionality allows the unit to audibly announce the name of upcoming streets and points of interest (POIs), letting drivers keep their eyes on the road while navigating through busy traffic and tricky roadways. Garmin StreetPilot 2720 has been discontinued. Accessories, spares and parts are still available for your StreetPilot 2720. The Garmin StreetPilot 2720 boasts a new WQVGA, color, automotive-grade, sunlight-readable, touchscreen display that automatically adjusts the unit's backlight for optimum viewing in any amount of light. Drivers can view the map in a three-dimensional perspective, or a top-down track-up or north-up view. As an added benefit, you can now import customized points of interest with the help of Garmin's free POI Loader software . The possibilities are endless - upload safety cameras or school zones, and you will receive a warning if you are traveling too fast. In addition, an optional proximity-alert feature notifies you of upcoming custom POIs. In addition to point-to-point navigation, the StreetPilot 2720 can calculate the most efficient route between multiple destinations - a real time-saver for realtors, sales forces, and errand-runners. Drivers can also tell the unit to avoid specific areas or road segments when calculating a route. The Garmin StrretPilot 2720 is powered using the external speaker with a 12-volt adapter cable or A/C power adapter (both included in purchase). The Garmin StreetPilot 2720 also offers WAAS-enabled support to ensure the highest degree of GPS accuracy. The Garmin StreetPilot 2720 includes a pre-programmed 2.5Gb hard drive that stores City Navigator detailed maps of the UK and Europe. Motorists can navigate to a specific address or access an industry-leading database of more than five million points of interes - including lodging, restaurants, gas stations, and local attractions. The intuitive, menu-driven touchscreen ensures that navigating the unit is as easy as navigating the road. Looking for accessories and spares for the Garmin StreetPilot 2720 view them all here. 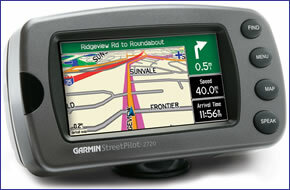 All parts are genuine Garmin product and specifically designed for use with the StreetPilot 2720 sat nav.